The crowd said it all. Massachusetts Congressman Steven Lynch came to win. This afternoon the Florian Hall was packed with people, spilling out into the parking lot of the Iron Workers Local 7 union hall in South Boston. Lynch is running for John Kerry’s vacant Senate seat. He started the day in Springfield, MA where he officially announced his candidacy. 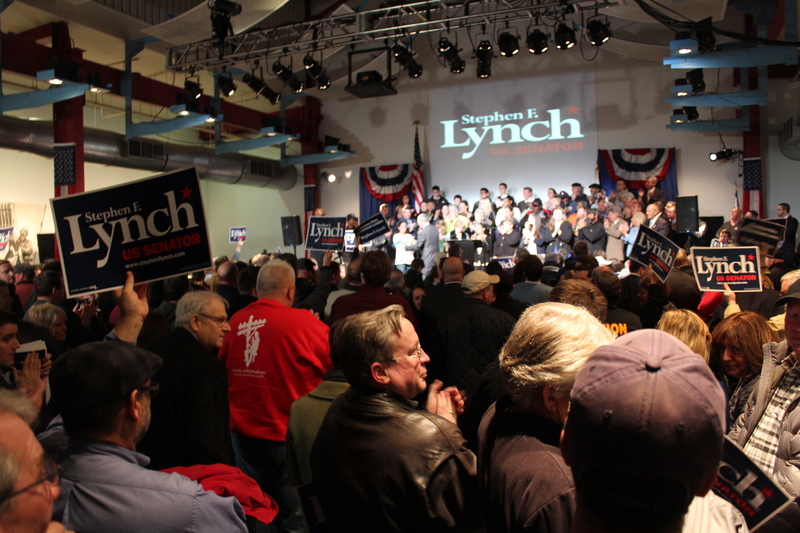 Lynch’s final stop was the union hall, where he formerly was an iron worker and local union labor president. Union member Kim Burleigh thinks Lynch is the ultimate candidate to represent the working class. “He’s been there…. been laid off. He’s been in the union, he’s been on the ground and walked the lines with us. He knows what its like and I think all labor will support him”. City Councilor John Correggio is endorsing Lynch for the same reasons. “He come up from the bottom. He’s for working families. This is what we want – that flavoring in the US senate”. Supports like Correggio think Lynch can push the bipartisanship efforts further. President Jay Hurley of Iron Workers District Council of New England States credits Lynch’s background for his bipartisanship capabilities. “An iron worker toughens you up and prepares you for other things in life. If you look at his voting record he doesn’t always fall in line, he votes his conscience. I think he’s a step in the right direction”. The Congressman already has an idea of what the “right direction” will be if he gets the seat.